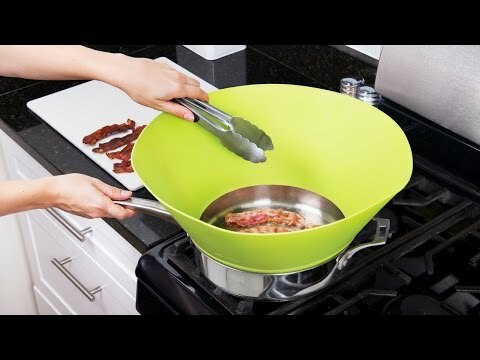 Keep your simmer and sizzle contained with this silicone splatter guard. Frywall lets you sauté, fry, and marinate at high temperatures without spattering your counters and walls. Its soft silicone fits snugly in 8” pots and pans, and is angled to let you access the food as you cook. Stick it in the dishwasher to clean, and fold it up to store. Dimensions: 17" diameter x 6"
What a time saver. I am going to get another one.